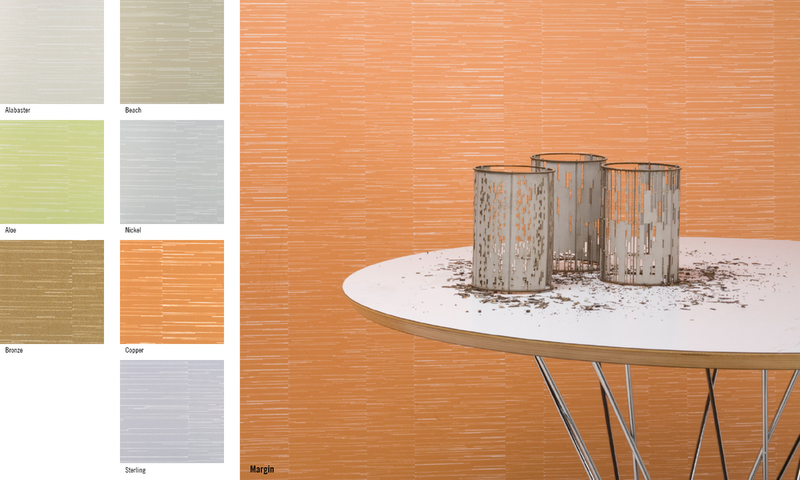 LTL's collection of wallcovering designs for Knoll Textiles, entitled Parallel Lines, explore the intersection between decoration and drawing. The collection is based on the prohibition against marking on walls, a prohibition wallcoverings are frequently employed to enforce. Each pattern is produced through the digital repetition of a select number of scanned hand-drafted graphite lines. The patterns exhibit manual flaws and digital precision and have a built-in spatial play and a resolution that allows different readings: up close the details of the variations of the pencil work and logic of the pattern is visible; from afar the pattern has subtle spatial and optical effects. The pattern, Vector, uses seven different pencil lines that fade from dark to light resulting in subtle undulations that move up and down the wall. Margin reads as a series of vertical columns produced out of only horizontal lines. Perimeter is based on nine different rectangles, each with its own line type, overlapped and layered to provide a sense of depth.